Pizza consists, at its core, of three things: dough, sauce, and toppings. It's hard to believe that this simple dish could spawn hundreds of variations and result in a $30 billion worldwide industry, not to mention the huge number of chefs and pizza-makers who specialize in perfecting this single dish. Let's review the 9 most popular varieties of pizza in America. The Neapolitan pizza is the original pizza that left Italy and arrived with Italian immigrants in the United States. This is the pizza that launched American pizza fanaticism. In fact, Italy has sought UNESCO heritage protection for the Neapolitan pizza. The dough is made from Tipo 00 wheat flour and the crust is thin, crunchy, and baked in a wood-fired oven. The pizza should have minimal toppings—perhaps San Marzano tomato sauce, buffalo mozzarella cheese, and basil—because too much sauce or cheese will weigh down the crust and make it soggy. California style pizza uses a dough base similar to the Neapolitan or New York style pizza and jazzes up the base with unusual and uncommon ingredients. This style of pizza is generally credited to Chef Ed LaDou who developed a pizza with ricotta, red peppers, mustard, and pate, that Chef Wolfgang Puck tried and loved in the early 1980s. Chef Puck immediately hired Chef LaDou to work at the newly opened Spago in 1982 and Chef LaDou continued creating innovative pizzas, including varieties with duck sausage and smoked salmon. In 1985, Chef LaDou created the first pizza menu for California Pizza Kitchen, including its signature barbeque chicken pizza, which spread California-style pizza to a national audience. In the 1940s, Pizzeria Uno in Chicago developed the deep-dish pizza, which has a deep crust that lines a deep dish, similar to a large metal cake or pie pan. Though the entire pizza is quite thick, the crust itself is only of thin to medium thickness, and the pizza has a very thick large layer of toppings. Because the pizza is so thick, it requires a long baking time and, if cheese was added on top, as is usual with most pizzas, the cheese would burn. So, in a deep dish pizza, the toppings are usually assembled "upside down" with cheese, vegetables, and meats placed on top of the crust, and an uncooked tomato sauce on the top layer, to help the vegetables and meats cook all the way through in the oven. In the mid-1970s, Chicago restaurants Nancy's Pizza and Giordano's Pizzeria developed a variant of the deep dish pizza, known as the stuffed pizza, which is even deeper and has a larger topping density than any other type of pizza. To keep the cheese and toppings contained, a thin layer of dough is added above the tomato sauce with a hole in the crust (similar to a pie) to let steam escape, and tomato sauce is added above the top crust. The Chicago thin crust is crispier and crunchier than the New York style and normally cut into squares (or tavern cut) rather than diagonal slices. The Quad City area, a group of five cities between Iowa and Illinois, has developed a variation of the Chicago thin crust which uses a spicy sauce, large amounts of meat, and is cut into strips or squares. The Detroit style pizza is a square pizza, similar to Sicilian-style pizza, with a deep-dish crust and marinara sauce sometimes served on top. The crust is usually baked in a well-oiled pan to develop caramelized crunchy edges. Detroit style pizza has developed a larger fan base as Detroit-based Little Caesars launched a Detroit-style deep dish pizza available at its nationwide chains. Greek style pizza generally refers to the pizza served at Houses of Pizza, run by Greek immigrants in New England. The pizza crust lies in between the crunchy New York style pizza and its thicker Sicilian cousin and it is baked in a heavily greased cake or cast iron pan, which results in a thick golden, crunchy crust. Many of these pizzas are topped with typical Greek ingredients, such as feta, artichokes, and kalamata olives, though a Greek pizza may simply be topped with tomato sauce and mozzarella cheese. New York style pizza originated in New York City in the early 1900s and is a mild bastardization of the Neapolitan pizza. The pizza has a thin and crunchy crust with a perfect balance of thin tomato sauce, and lots of grated mozzarella cheese. The pizza is meant to be folded over when eaten. Most pizzerias in the United States tend to serve a form of New York style pizza. 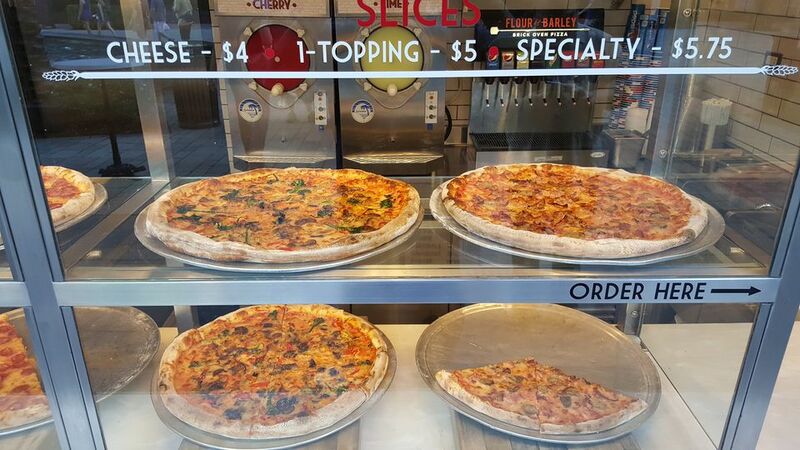 St. Louis style pizza, a unique take on New York-style pizza, originated in the 1960s by Ed and Margie Imo of Imo's Pizzeria. The pizza has a thin cracker-like crust, made without yeast, and is topped with Provel cheese, rather than mozzarella. Provel cheese is a white processed cheese, made by combining cheddar, mozzarella, and provolone cheeses, and used primarily in the St. Louis area. The tomato pie is a type of pizza created in the early 1900s by Italian-Americans in the Philadelphia metropolitan area. Papa's Tomato Pies, in the Trenton, New Jersey area, claims to be the United States' second oldest pizzeria. Unlike the New York Style pizza, where cheese and toppings are placed on top of the sauce, in the tomato pie, the cheese and toppings are placed under the tomato sauce. Because of this differentiation, the dominant flavor of the pizza is the sweet and tart tomatoes that top the pie.